Warren Bentley produced a finishing masterclass to set Gosport Borough on their way to a 3-1 National League South win over Eastbourne Borough at Privett Park. The striker proved the difference between the two sides with a hat-trick which fired Alex Pike’s troops to a second successive league win. 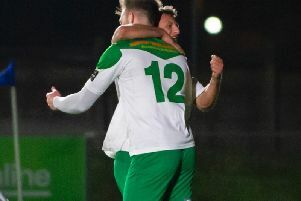 The 25-year-old already looks to be a natural successor to Borough’s all-time record goalscorer Justin Bennett, who moved on to Salisbury during the summer. With five goals in his first three games for the club, he is making the step up from Southern League football look easy. Bentley is carrying on where he left off at Winchester City, having scored more than 100 goals in just two seasons with the Hampshire outfit. ‘He was ruthless and clinical in his finishing,’ said the Borough boss. ‘His work-rate along with Chris Flood up top was immense. ‘I don’t think I’ve ever had two players who have worked so hard up front. ‘They ran themselves into the ground on a hot day when a lot of people might have tried to save energy. ‘Bentley showed defenders cannot afford to make any mistakes because he will punish them. ‘He was a constant threat, had four chances and scored three goals, which is a tremendous ratio at this level. ‘My biggest problem is going to be keeping hold of him. He is still only 25 and I know for a fact a number of professional clubs were taking an interest last season. Borough fell behind in the 21st minute when they failed to clear a corner and Elliott Romain scored with a deflected shot. The hosts were presented with an equaliser 10 minutes before half-time when Bentley punished an error in the visitor’s defence with a low finish. More sloppy defensive play from Eastbourne presented Bentley with another chance 10 minutes into the second half and he made no mistake, firing across the goalkeeper and into the far corner. In the final minute, Bentley crushed any hopes of an Eastbourne recovery by crashing a left-foot shot into the roof of the net. Pike added: ‘That alleviated a lot of pressure. ‘In the first half we gave away a sloppy goal by failing to defend a short corner. ‘Once we got in front, however, we showed good organisation to keep Eastbourne at bay. ‘I have to be happy with six points from our two first home games.